ACHTUNG - Bei diesem Artikel handelt es sich um einen Bausatz ! Er muss noch zusammen gebaut und lackiert werden ! 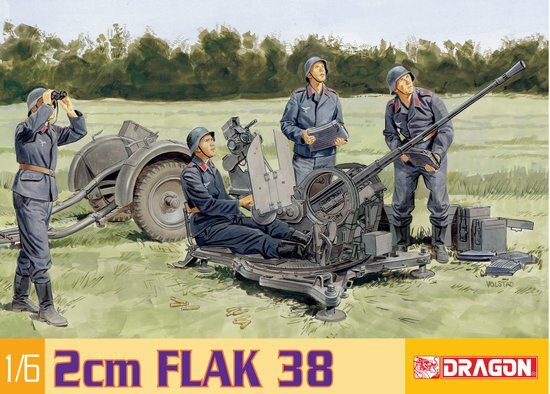 A fine 2cm FlaK 38 antiaircraft gun is the latest arrival in Dragon’s expanding range of 1/6 scale kit sets. The weapon is fully detailed and accurately resembles the original gun. Of course, in this larger scale no detail has been left untouched by the designers. Furthermore, it moves like the real thing, with the weapon able to rotate 360^(o) on its platform, and with the barrel able to elevate to any angle selected by the modeler. As the cannon elevates, the mechanism is carefully engineered so the gun sight moves in tandem. The incluson of a metal gun barrel ensures detail is maximised, and the distinctive holes found on the flash suppressor are present. 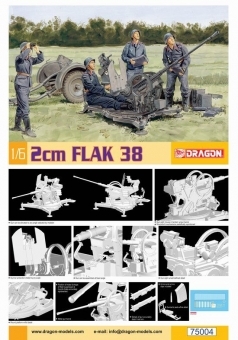 Although it’s full of complex detail, this plastic kit is simple to assemble. A ready supply of ammunition means this compact weapon is also ready to immediately swing into action against either air or ground targets! NOTE: Figures and Trailer are NOT included / Figuren und Trailer sind nicht enthalten !